Wall confirms it was about a year and a half before police contacted him to give a statement. Fair to say your memory of the crime scene, layout of the office and where body was located was pretty vague by that time? asks McConnell. Wall agrees. Paramedics done. Next up are funeral home employees who removed Oland’s body from the murder scene. Sharlene MacDonald works at Brenan’s funeral home and was involved in transporting the body to the morgue. Kind of like it is today? asks McConnell, referring to Wall having difficulty remembering if he went to the left or right of the table. Wall agrees. 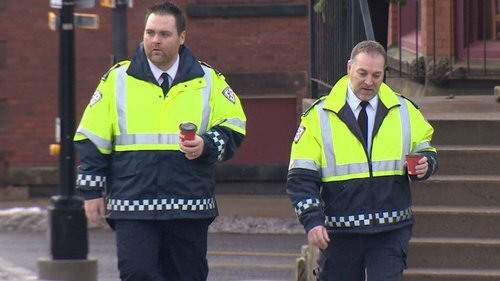 Macdonald had attended scenes with police before and was used to the procedures although says there was an usual request made to transport the body face down. MacDonald describes carrying body in "pouch" on stretcher, feet first down steep staircase to street level. She was at the feet end, Adam Holly and an officer at the head. She couldn't handle the weight, An officer came to her aid, she says. Body was transported to the morgue at the Saint John Regional Hospital. MacDonald says she disposed of her latex gloves there. She had turned them inside out and placed them in her pocket when they left the scene. Condition of gloves? Can't recall. Knee is done direct examination. Court takes a short recess before defence lawyer James McConnell begins cross-examination. Defence lawyer James McConnell is asking her about what protective gear she wore in the crime scene that day. Any protective booties? No. They do have full protective gear available at the funeral home - full clothing covers, shoe covers and masks, she says. They didn't have it in their vehicle that day and no one instructed them to go get it, she says. MacDonald answering questions from defence lawyer James McConnell. Police ever ask to examine your shoes following your presence at the crime scene? No. Did you step in any of blood in the office? asks McConnell. "No, I was pretty careful to not," she says. You could see it pretty easily, it was easily avoidable, she says. Anyone ever suggest to you there might have been an easier exit to remove the body - out the back door and into the back alley? No. MacDonald explained earlier it was awkward moving the body down the stairs and out the front door. Did you have difficulty remembering details because of the time lapse? Yes. Next up is second funeral home worker Adam Holly who also helped transport Oland’s body to the hospital morgue. 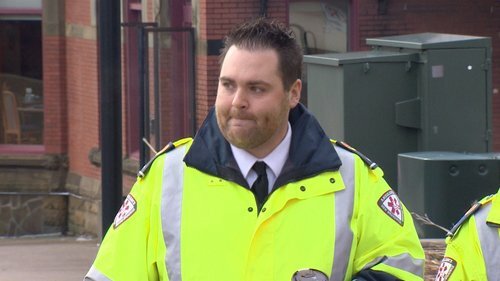 Police didn't interview MacDonald until March 2014, the court hears. Harder to remember things than if it had been a day or two after the July 7, 2011 event? asks McConnell. "I would say yes," she replies. Would the circumstances of this file be one where you would wear it? "Probably if I had to do it over again, but at the time, with it having been dried blood, we didn’t see much of a need," says MacDonald. Did you notice any blood on your shoes? No. Holly telling a similar story as his coworker. He says he entered the office ahead of her and went to the right side of the table. His main role was to get the stretcher ready, he says. 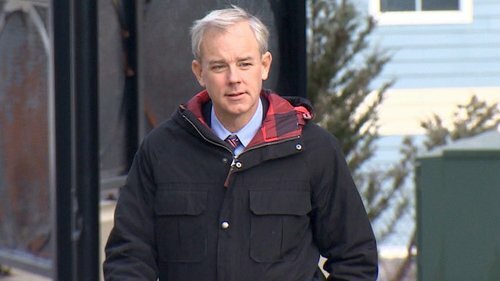 Police handled lifting Oland's body and placing him in the body bag on the stretcher, he says. Two seatbelts on the stretcher were fastened to ensure the body was secure before proceeding down the stairs, he says. Holly estimates they were only in the bloody office for about 10 minutes. He says he didn't touch anything. "We're always instructed to keep our hands to ourselves," he says. He discarded his gloves at the funeral home, he says. They were "clean." Knee is showing Holly some of the crime scene photos, asking him to explain where he stepped, how far he went, where he stood etc. Holly being questioned by defence lawyer James McConnell. Your first murder scene? Yes. By this time was forensic specialist Sgt Smith in the office with protective gear on? Yes. Were you given any protective gear? No. Would you have worn it if asked? Certainly. If forensic officer Sgt. Mark Smith had instructed you to put on booties or other protective gear, you would have? "Absolutely." Smith was the only officer you observed wearing full protective gear? Yes. Did police first take a statement from you 32 months after the murder? Yes. Did you step in any blood? asks McConnell. Can't say with absolute certainly, but most likely no - wasn't close enough, says Holly. Police ever ask to see your footwear? No. McConnell asks if he was aware there was another exit they could have used - the back door that exits to an alleyway behind the building at almost ground level. No, says Holly. No one mentioned it? No, he says.